We have a great line up of interesting and fun activities this spring. If you are thinking about joining Rotary, or are a Rotarian visiting from another club, please feel free to join us. The sun shone on us April 2nd for our Scavenger Hunt on Whistler Mountain. Our group in excess of 50 persons including the 6 teams, some skiing, some observing had a fine time vicariously or cheering on the costumed participants that were hot on the trail after all of the 30 locations to find, photograph, then downhill to the finish at Blacks Pub. 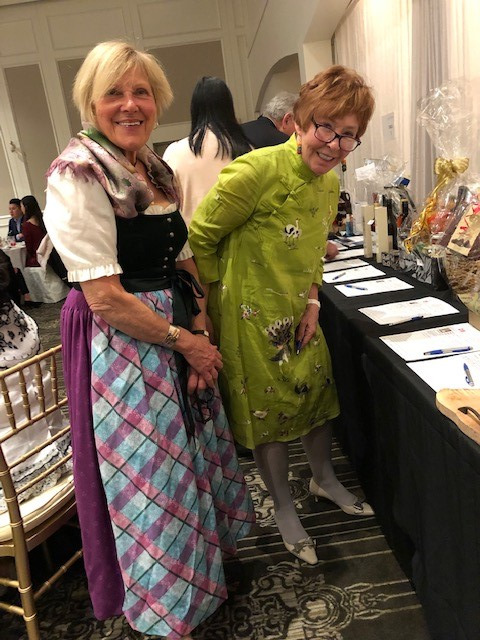 Janice and Erika attended the Rotary Foundation Dinner on March 9th. 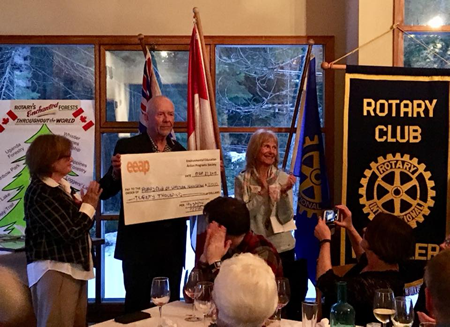 Janice carried four cheques from the Rotary Club of Whistler members in American Funds to donate to Rotary International. We dressed in ethnic outfits, Austrian and Chinese. Erika bought a lot of items from the silent auction table. Past District Governor Dan Evans presenting, Past District Governor Lyn Strochn, President Elect Brian Brown and Bobbie Rathburn. Our Paul Harris Awards Night February 26th was interesting and gratifying topped off by a Whistler Library presentation previewing the upgrade to the computer lab,layout and the new Wonder Lab. 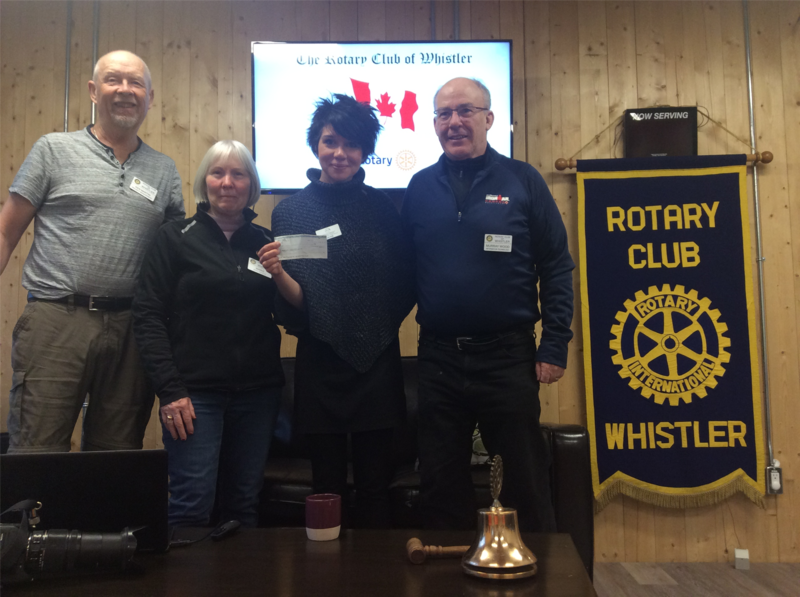 The Rotary Club of Whistler donated $1,000.00 to the WCSS. Jackie Dickenson Executive Director of the Whistler Community Services Society gave us an outline of Whistler Outreach whose home is the new Whistler Community Services Centre on Nesters Road. For a review of Jackie's presentation see more! 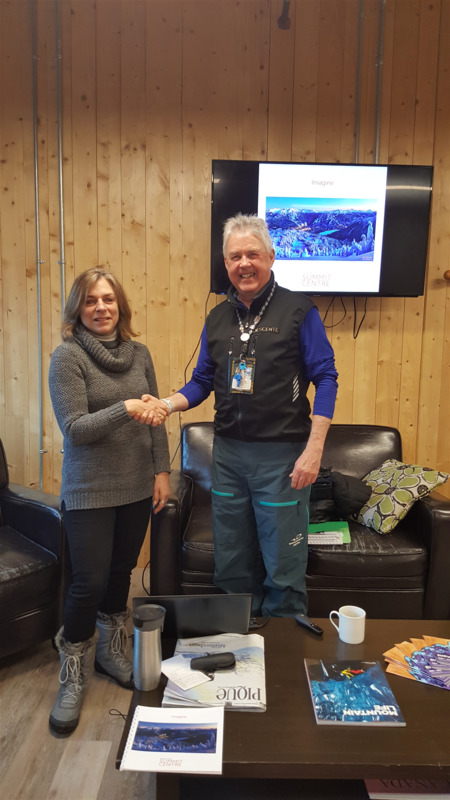 − Vicky Bunbury was our speaker at this Tuesday AM Meeting and introduced herself as been in Whistler since 1976 when her family moved here after a very quick assessment of where they parents wanted to live and raise their family. As a young adult Vicky put together the original Whistler Kids Ski Program and ran it for 14 years. She gave us some history regarding the student exchange program: the 1st student from Whistler was Debbie Bishop daughter of Bob Bishop, the inaugural 1st President of Rotary Club of Whistler. gatherings of all types, including training and workshops for all ages 4 - 85 and on. A 24-7 facility that is aligned with an ordinary school that welcomes all strata for the community. www.whistlersummitcenter.org It is is hoped the ground breaking will commence in 2020.
conclusion of their vacation which included a river cruise. The presentation included pictures, maps and a monetary focus on the well being of this part of Eastern Europe. 13 international exchange high school students converged on Whistler this weekend for cross country skiing, a visit to the Tube Park, great food and fellowship. Students from Brazil, Russia, Bolivia, Italy, Spain, Germany, Norway, Denmark and Sweden, France, Belgium and the Czecha were hosted by Rotarian families, Thank you to all the hosts, the contributors to the Saturday amazing pot luck dinner (and the Malaher's $150 food donation) and organizers for a great weekend. All the kids really enjoyed themselves, as did the hosts. (photos by David Oakes). Click here for many more photos. JIm Watts talking about the coming self-driving vehicles and their impacts at our January 15th morning meeting.. 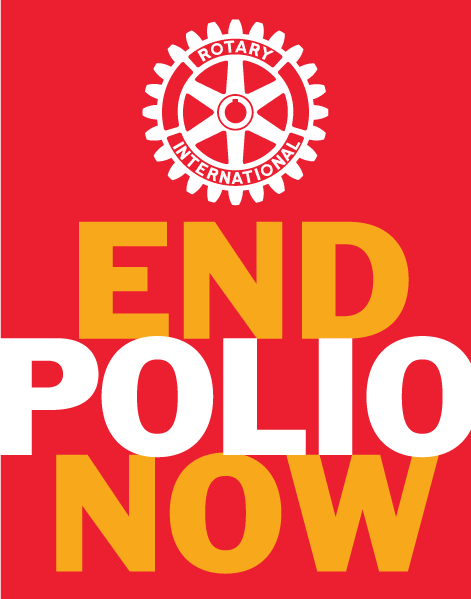 It's World Polio Day! The day when we reflect on the progress we have made against this horrible disease and reset our focus to eradicate it for good. This year marks the 30th anniversary of the Global Polio Initiative which is an international effort to eradicate the disease. Rotary plays a major role with the initiative. 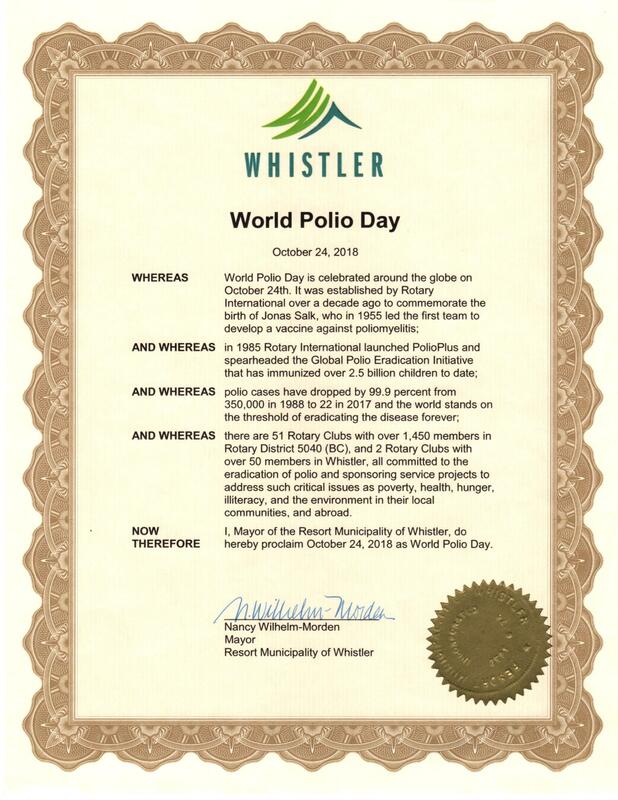 Closer to home the Resort Municipality of Whistler has declared October 24th as World Polio Day and we thank the Mayor and Council for recognizing this important day. A copy of the proclamation is on the left (Please click image to read the proclamation). Rotary will feature a Livestream event from the College of Physicians in Philadelphia, Pennsylvania that begins at 6:30PM Philadelphia time or 3:30PM Pacific time. The livestream will feature global health experts and celebrities sharing our progress on the road to polio eradication. A recording of the livestream will be made available on endpolio.org after the event. Wendel Moore, organizer extraorinaire and long time Rotarian has done it again and brought to our morning meeting a fantastic speaker. Curtis Collins, who biked to the meeting in chilly early morning temperatures, was chosen as the new Director of the Audain Art Museum. Curtis has adapted and clearly relishes being in Whistler, taking to the lifestyle like a duck to water. Extremely qualified, enthusiastic and experienced, he is working on increasing the visitor numbers now that the initial rush to visit the museum has subsided. Curtis is looking for help to expand the reach to broaden interest and include people who come to Whistler for culture as well as sports. We at Rotary will do our best to help get the word out. Welcome Curtis and thank you for your time. We enjoyed your introduction greatly! 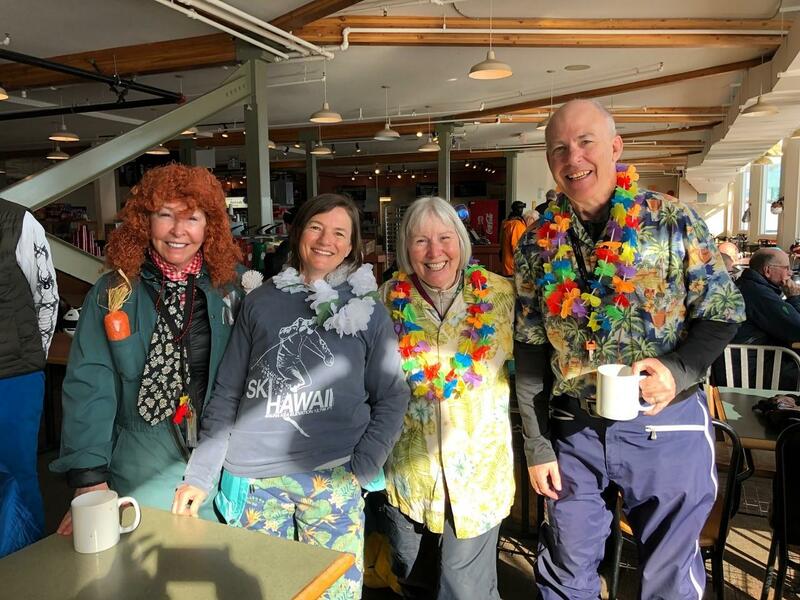 During the regular Tuesday morning meeting the Rotary Club of Whistler had two thumping good speakers who really got the blood flowing with or without caffeine. Peter Chrzanowski, extreme skier and uber adventurer described a thrilling event which he is organizing for September 1st. The "Aerothlon" to be held in Pemberton will be the first of this equivalent to Ironman in hang gliding, running and biking. http://www.explorex.net Peter is a producer/director/writer who can be contacted about volunteering for this event in Pemberton or simply check out his web site especially if you need an adrenaline reboot. At the same meeting Bryce Reynolds, Program Coordinator for Soap for Hope, Vancouver Island gave us an inspiring presentation on the collection, re purposing and distribution of used soap, liquid and bars from hotels and other locations. The bars of soap or single use ampoules of soap may be used only once then discard into trash. Entirely volunteer supported and organized, the soap once prepared, is shrink packaged in small or large amounts with a cloth and distributed to poverty stricken, challenged areas over the globe and in our own needy communities across British Columbia. Bryce was so effective in his delivery that a person wanted to dig right in and help. We Worked Hard, He Led and He Won !! 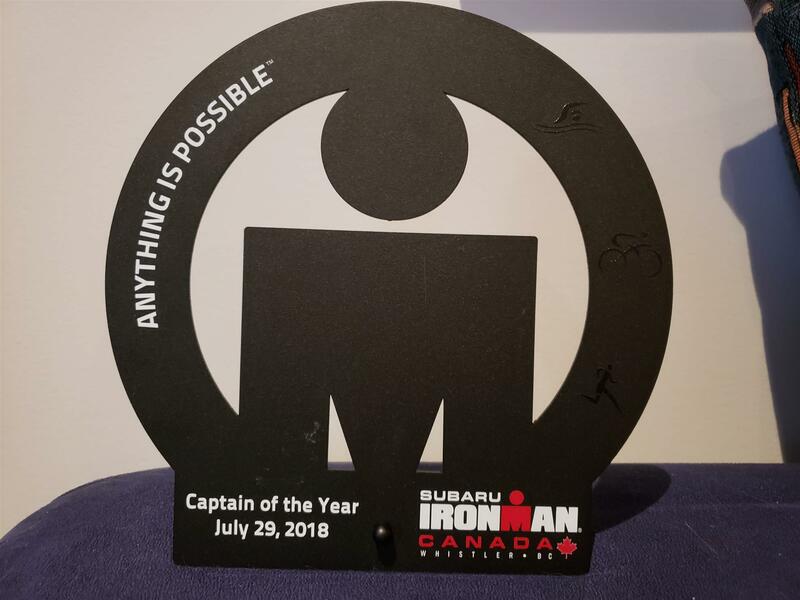 The Resort Municipality of Whistler hosted the Subaru- Ironman - Canada banner event for the 6th time July 25th to the 30th this year. The Rotary Club of Whistler rolled out the red carpet. under the leadership of Murray Wood, dedicated Rotarian and this year's Assistant District Governor. His team warmly and heartily welcomed, using our special brand of cheer for the athletes and their families helping make their introduction to Whistler and the big race happen. Murray won Best Captain for his Station! 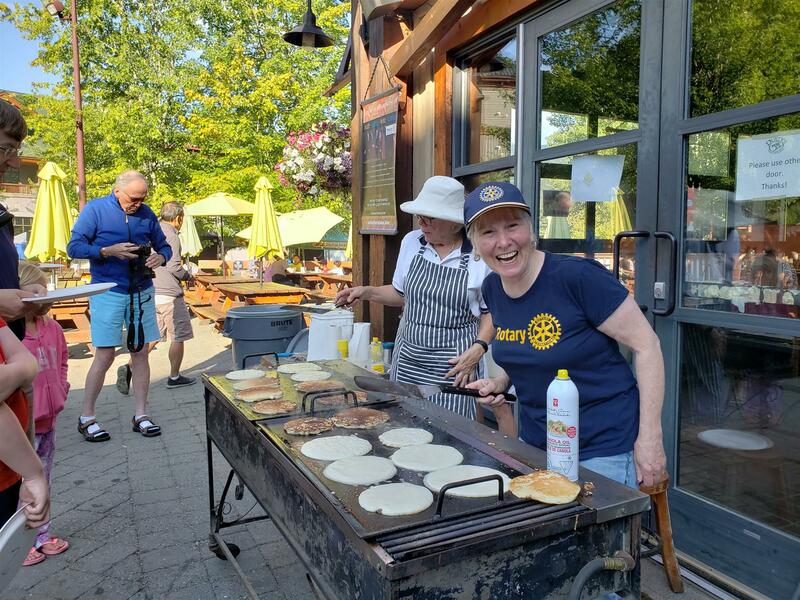 On August 4th and 5th the Rotary Club of Whistler served up pancakes outside of Dusty's in Creekside to the salivating masses that lined up for this tasty breakfast treat. Money Man David Oakes, long time dedicated Rotarian is in the background and Pancake Chef Gill Forester is in the white hat concentrating on perfect pancakes after tirelessly organizing the event and the donations. Perky pancake flipper Marg Pallot with her endless cheer and smile doled out these yummy cakes to an ever waiting line up. Some youngsters proudly boasted chowing down on as many as 12 cakes, drizzled with Canadian Maple syrup, each of the two mornings! 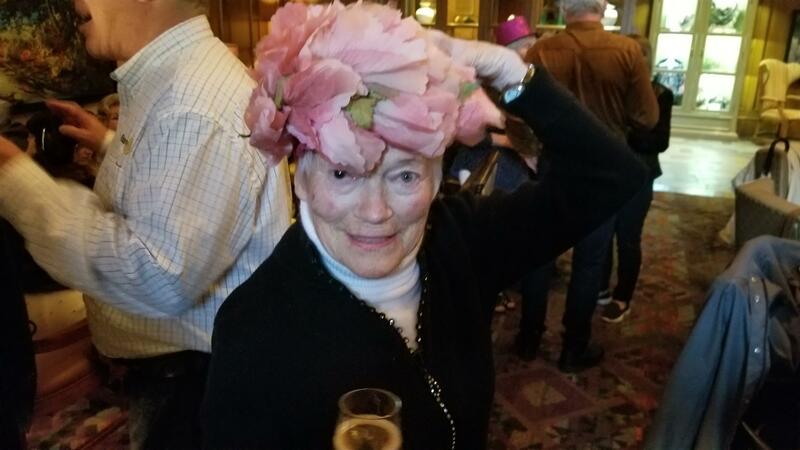 During the July 24th Rotary Club of Whistler morning meeting at the Whistler Racket Club Ewa (Eva) Zebroswski daughter of Walter Zebrowski, namesake of Eva Lake, updated the us on how she would like to increase the rewards and the receivers of the Walter Zebrowski Scholarship. Eva Zebrowski, the daughter of one of our charter members Walter, talked to us about Walter and how she hoped his fund that we manage would be able to provide for a second scholarship at the Whistler High School..
During the evening on the same date, at the Resort Municipality of Whistler Council Meeting Eva addressed the Council asking for funding for an additional scholarship in honour of her fathers faithful and remarkable dedication to the development of the community in our valley. During the Tuesday July 24th morning meeting of Rotary Club of Whistler Napalese trekking guide Kalu Tamang entranced 25 members and guests at the Whistler Racket Club with facts and stores including breathtaking photos of what life looks like among the world's tallest peaks and the devastation following a major earthquake that ravaged his country. The Rotary Club of Whistler is excited to announce the creation of an Environmental Education Fund for the purpose of providing annual seed funding to local or international environmental sustainability education projects or scholarships. The fund has been created with a very generous donation of $20,000 from the Environmental Education Action Programs Society (EEAP) at our March 29th Alumni Night celebration. EEAP, initially established in 2003 by club President Ken Martin, has been involved in numerous education programs over the ensuing 15 years as was the recipient of the 2005 NR Canada Outreach Program of the Year. 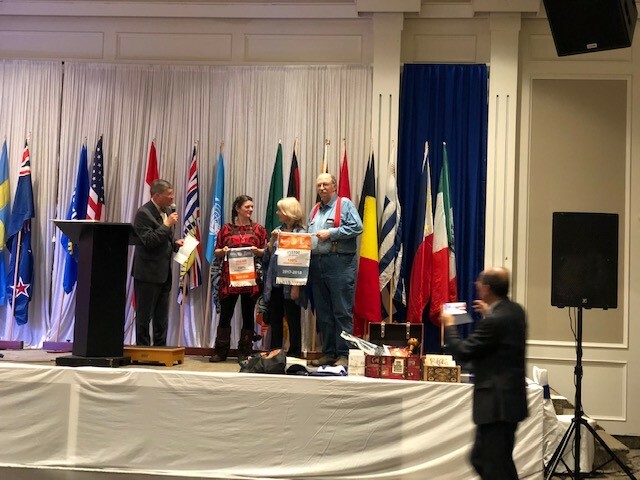 Past District Governor Lyn Stroshin (right) and Sea to Sky Area Governor Liz Scott (left) are shown receiving the EEAP cheque on behalf of Rotary. Ursula Morel also donated $200 to bring the initial fund to $20,200. Rotary extends a big thank you to both President Ken and Ursula Morel. Rotary Club of Whistler Rotarians: Is there a Club member or someone outside the Club who has made an incredible contribution that should be recognized? Rotarians, interested in making a donation to the Rotary Foundation? Follow the instructions at Check, draft, or wire payments. A word to those who do not want to be fined the last Tuesday of every month. Rotary 'stuff' is available on-line at Creative Embroidery Rotary International .